Archaeologists from Inrap uncovered the remains after digging for several weeks. ARCHAEOLOGISTS SAID TUESDAY they had discovered the remains of victims from a 6,000-year-old massacre in Alsace in eastern France that was likely carried out by “furious ritualised warriors”. The corpses of 10 people were found outside Strasbourg in one of 300 ancient “silos” used to store grain and other food, a team from France’s National Institute for Preventive Archaeological Research (Inrap) told reporters. “They were very brutally executed and received violent blows, almost certainly from a stone axe,” said Philippe Lefranc, an Inrap specialist on the period. The arms were likely “war trophies” like those found at a nearby burial site of Bergheim in 2012, said Lefranc. He said the mutilations indicated a society of “furious ritualised warriors”, while the silos were stored within a defence wall that pointed towards “a troubled time, a period of insecurity”. “It appears that a warrior raid by people from the Parisian basin went wrong for the assailants, and the Alsatians of the era massacred them,” he said. However, in the long run, it was the “Parisians” who had the last laugh. 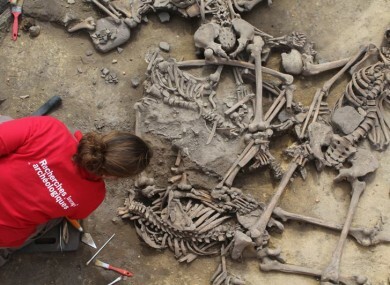 Email “Bones of victims of 6,000 year old massacre discovered in France ”. Feedback on “Bones of victims of 6,000 year old massacre discovered in France ”.